New Israel-Palestine Talks: Is Peace Really Possible? This piece originally appeared at LobeLog. 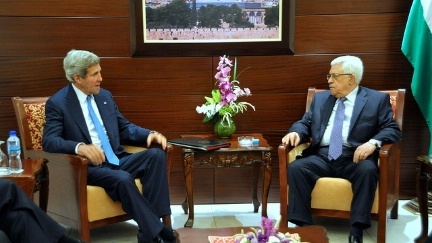 I’m always pleased when something surprises me in the realm of Israeli-Palestinian diplomacy. It doesn’t happen often. Today’s announcement that Secretary of State John Kerry has apparently succeeded at bringing Israel and the Palestinian Authority back to the table was one such surprise. The announcement should not be overstated, of course. At this writing, there is a proviso out there that a few details still need to be worked out. So, there’s a convenient back door that both parties can exit through. Even if the talks did resume, there is no reason to believe they will succeed. As Stephen Waltdetails, Israel’s governing coalition remains hostile to a two-state solution, the Palestinians remain divided and, despite whatever pushes and prods Kerry used to achieve this outcome, the US remains politically paralyzed and feckless. Coming up with a positive scenario that is even marginally realistic is therefore not easy. But here is one shot at it. One aspect of Kerry’s bridge-building between Benjamin Netanyahu and Mahmoud Abbas presumably included negotiating based on the 1967 borders without stating that publicly as a specific frame. But any talks that proceed in that fashion could result in Naftali Bennett’s Jewish Home party bolting the coalition. If that happens over peace talks, Labor and perhaps Meretz could join to support two states. Labor alone would increase the governing majority from 68 seats to 71 (out of 120) in the Knesset; if Meretz joins too, that makes 77 seats. Shas has also indicated willingness to support such a deal, but they have historically been pro-two-states while opposing a compromise on Jerusalem. Shahs’ joining would bring 11 more seats and potentially create a dominant majority, but they’re such a wild card that a two-state coalition might be better off without them. A coalition that includes Labor and excludes Jewish Home would certainly be capable of approving any deal Netanyahu could conceivably sign. But it would still be restrained by the leading party, Likud’s opposition to two states and by the desire of the Israel Beiteinu party to minimize the Arab minority in Israel, not to mention Netanyahu’s own disposition against a viable and sovereign Palestinian state. Still, Bibi could probably count on enough votes outside his coalition — from Arab parties and some others — to get a deal done. On the Palestinian side, things are more complicated. A sine qua non for any deal to actually take hold is the reunification of the West Bank and Gaza. No West Bank-only deal can possibly be acceptable. Robert Danin of the Council on Foreign Relations presented a plan to reconnect the West Bank and Gaza while marginalizing Hamas. A more ambitious route, with a much higher chance of success, would be for the US and Israel to allow and support new elections, treating both territories as a single unit and, this time, actually abiding by the outcome. If a realistic two-state deal is on the horizon — one which stands a chance of being at least minimally acceptable to the Palestinians in the Occupied Territories — Hamas would probably lose such an election, and in any case, it would have to find ways to accommodate itself to such an agreement. That is far from impossible for Hamas, as they can work in a government which they consider accountable to the will of the people while holding its own stances, such as refusing to recognize Israel. On the other side, the Likud would be doing something similar. Any realistic agreement is probably going to involve Israel keeping the three large settlement blocs, which is going to be a tough sell to the Palestinians because of the way the Ariel and Ma’ale Adumim settlements slice apart the West Bank. Conversely, any conceivable agreement would also mean sharing Jerusalem and Israel taking at least token responsibility for the creation and long-term plight of Palestinian refugees, which might be an even tougher sell. Therein lies the rub for all of this. For the past several years, I’ve maintained that the Oslo Process is dead, and the solution to the Israel-Palestine conflict needs to be reformed. This does not imply that a solution revolving around two states for two peoples cannot be reached, but that the Oslo parameters and thinking have failed. The upcoming round of talks may finally prove that thesis right or wrong. Although it has become much more difficult as the Israeli public and body politic has drifted well to the right from where it was in the mid-1990s, there is reason to believe that enough Israelis would support an Oslo deal to make it work. It is not at all clear that the same can be said about the Palestinians. The mistrust and frustration that resulted from Oslo has certainly hardened the resolve of many Palestinians. And while Palestinian refugees have always been central to the national narrative, few would argue that the refugees have a more prominent place in Palestinian negotiations today than they did twenty years ago. It will be much harder to sell an agreement now where Israel takes in zero or close to zero refugees than it was when the Oslo Accords were agreed upon. It will also be much harder to sell a demilitarized state to Palestinians weary and wary from years of violence from Israel. If the United States was willing to allow a Palestinian unity government to form again, that might assuage some of the skepticism among Palestinians. Kerry was able to push Netanyahu a little more than usual this week, but that was nothing compared to what will be required to get Netanyahu to agree to sharing Jerusalem, provide some concession on the refugee issue and limit his own draconian security demands, which currently include a very large Israeli presence remaining in the Jordan Valley. There is no indication that the Obama administration is prepared to apply that kind of pressure or weather the ensuing political firestorm such a move would bring. Still, some things have changed. It is no coincidence that the agreement to return to talks comes on the heels of the European Union’s announcement of new guidelines forbidding “grants, prizes and financial instruments funded by the EU from 2014 onwards” to be given to or shared with official entities of Israeli settlements. This was not a very significant financial blow, but even that bit of action caught Israel’s attention. It’s a lesson in what even the most moderate pressure on Israel can do, and why the major reason that peace is farther away than ever is that the US, and to a lesser extent other international actors, are shielding Israel from the consequences of its occupation. Perhaps that lesson will be learned. One can hope, especially since the picture painted above is an extremely unlikely — albeit theoretically possible — scenario, which is still a very shaky image of a resolution to this conflict. I fully expect these new talks to fail, if they even do get started. I hope I’m wrong and that a sustainable and equitable agreement can be reached. But the evidence suggests that the two sides are very far apart in terms of the maximum Israel is willing to give and the bare minimum the Palestinians need. Without much more of the sort of pressure the EU demonstrated this week, that’s not likely to change.